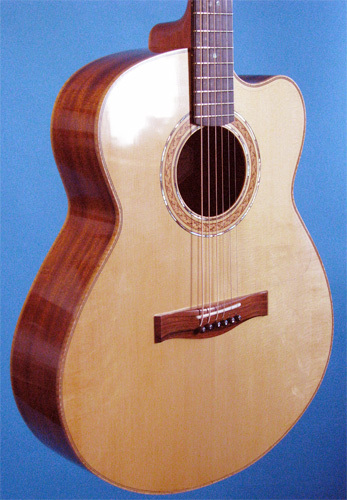 This Small Jumbo guitar is built of European spruce and Honduras mahogany, all of which was cut from the same plank. 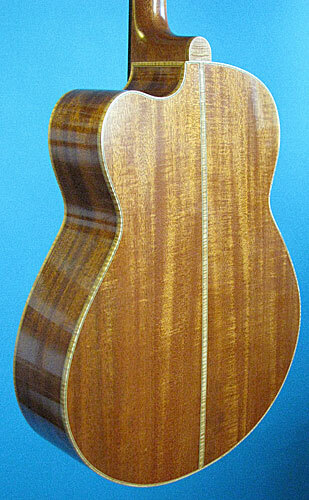 It has an ebony fingerboard, and trim of curly maple, and morado. 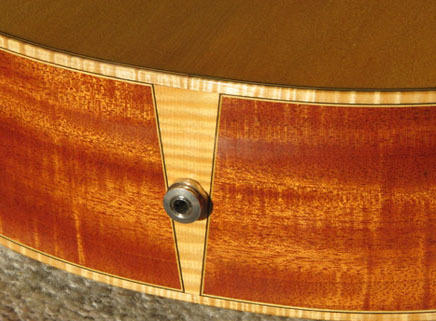 The braid soundhole inlay consists of primarily of cherry, maple, euonymus, and walnut woods, and the inner and outer shell bands are paua abalone. The slim, fast neck is 1-21/32” wide at the nut. Schaller M-6 Mini tuners with ebony buttons give precise smooth tuning and good balance. The head is joined to the neck with a hand-cut V-joint, which is stronger than a one-piece neck and minimizes the chances of a destructive headstock break. There are paua dots on the fingerboard, and bone side markers. The ’Martin’ style truss rod is easily adjustable through the soundhole with a 5mm Allen wrench.. The finish is a tough, highly polished, but very thin oil-resin varnish. No stain or filler was used on the wood to give a ‘natural’ look and show off the fine stripe figure of the mahogany and the curly maple of the trim. There is a large, but thin, clear Mylar pick guard. Although it does not have an installed pickup the tailblock is already drilled for a ’strap jack’. It is currently fitted with an ebony strap pin. The exceptional quality spruce top, my own ‘double-X’ pattern bracing, and careful ‘tuning’, give this instrument a clear, but warm timbre. It was designed with jazz and fingerstyle players in mind, and has a very even tone, with good balance, all the way up the neck. Although the workmanship and finish are very good, this guitar has been to a few shows, and has some small finish marks. It is ’recession priced’ at $3200, and comes with a well fitted TKL hardshell case.